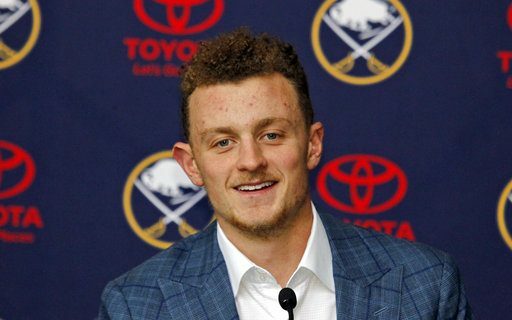 Based on Wednesday’s news conference, it certainly sounds as if the contract negotiations between Jack Eichel and the Buffalo Sabres couldn’t have been gone much smoother. And when they were done and the agreement was set, you could hear the exhale all over town. The Sabres certainly needed to get the deal done. They had thrown away a couple of seasons, more or less, for the chance to draft Eichel. He has shown enough to convince most people that he will be the centerpiece of the team for years to come. The Sabres needed to show to the public that they were committed toward achieving better results than they’ve had in recent years. As for Eichel, he’ll start collecting $10 million per year for eight years, starting in 2018. That’s pretty good for someone hasn’t turned 21 yet. He says he likes it here, and wants to be around when the Sabres get good. What’s more, he won’t be 30 when this contract extension is over, so he’ll still be in position for another decent payday at that point. The two sides both gave a little to get this done, which is the case even in a situation like this. The negotiators apparently came together on an eight-year deal rather quickly, which probably is the difficult part. From there, it’s just a matter of filling in the zeroes. Eichel couldn’t ask for more than Connor McDavid of Edmonton ($12.5 million a year), but he wanted more than the $8 million per year due to Ryan Johansen of Nashville. Let’s watch the negotiating ping-pong game – $90 million, $70 million, $85 million, $75 million, $80 million, done. From the Sabres’ perspective, the deal puts Eichel in the category of elite players. The signs are quite good so far, but you never know how that will work out. An injury a few years from now could spoil matters pretty quickly. But if you are the Sabres, you have to take that gamble. As for Eichel, he might have opted to wait a year and negotiated before becoming a restricted free agent. That can take some bizarre twists, as those who remember the Thomas Vanek contract know. If Eichel takes a Great Leap Forward in 2017-18, he’d probably earn more money in that Big Contract. But, his future is secure this way, and no one will be holding any telethons for him in the near future. As far as the exhale goes, Buffalo’s major sports teams have shown an inability to use much foresight in getting contracts done as free agency approaches over the years. It seemed like players went right down to the deadline, only to sign elsewhere, in both football and hockey. I’ll spare you from the examples; they probably are a little painful for some. In this case, the Sabres took the logical and professional steps and got the deal done. That’s the latest bit of good news in an autumn that has had more of its fair share of it for Buffalo’s sports fans.